Go to Settings and then Places. Click on the + button to add a place, if you allowed the browser access to your location, it should default that place to your current location, if not, pan to the right location and click there, the marker should move in the right place. The two circles default to 100m and 500m radii. Try to keep a good separation between the two for best results and less fake alerts. 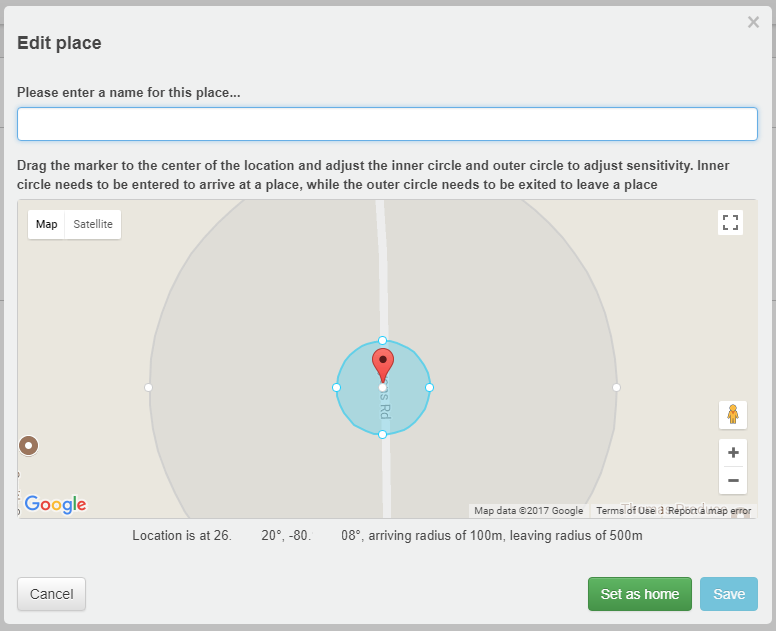 The minimum inner circle radius is 50m and the minimum separation between the circles is 200m. Give that place a name and click Save. Keep adding as many places as you need (up to 10). One of them (by default the first one) can be set as home by clicking the Set as home button. Only the home place will be driving the presence attribute of the sensor - the others provide other events for you to know when someone is arriving, has arrived, is leaving or has left each of them. When done, click Apply to save all changes. Open the webCoRE app and follow the same instructions from step 3 to register the newly installed webCoRE instance. If you skipped step 3, you will need to add the places at this time. Once you have at least one place added to the list, a green button should appear with the Setup sensor caption. Tap on it and you will get a dialog asking you to provide a name - this is the ST device name for the new presence sensor. Add a name, making sure it is easy to distinguish for any other existing devices you have in ST (i.e. add (beta) at the end of the name) and click Save. The green button should now disappear from the list. When it does, click Apply to close that window. 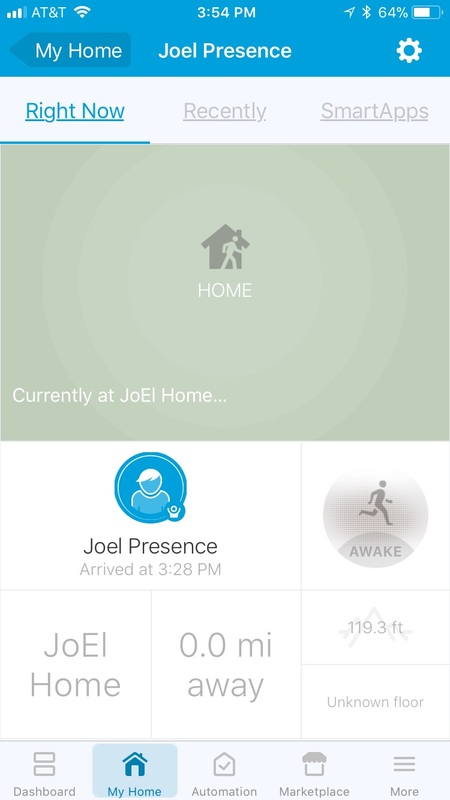 A new device should now be present in your ST app - it’s your brand new presence sensor. By default, the webCoRE instance used to create the presence sensor will automatically gain access to them so you don’t have to add the sensors to the available devices list. If you want to make the sensor available to other webCoRE instances then this will need to be done manually via the ST app. Grab your keys and leave with your ST app open Look awkward as you walk down the street with your eyes pinned to your phone. You know what to do next. Yeah, for now, sorry. Started working on the Android last weekend - will resume work this weekend - hoping to get something ready by end of this weekend or the next. Something wrong not working. The device shows in my IOS app but never changes to away. I have it set to the smallest possible geo fence. Also in the Sensor page, something is wrong. 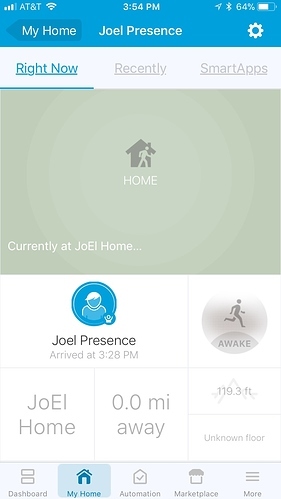 It says JoEL Home for location, but in the Dashboard and the app it is Joel Home. Everything is correct within Dashboard. 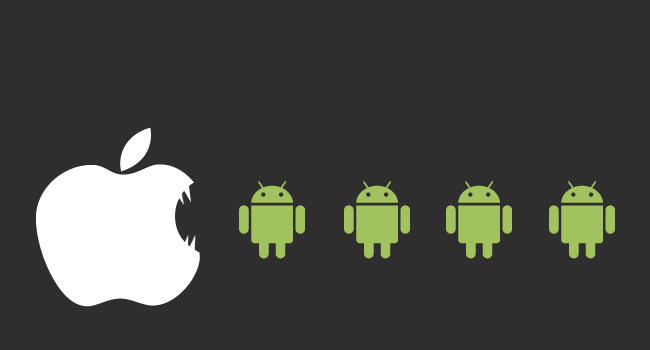 And device is available in WebCoRe. If you made changes to the places after installing the app, please open the app and go to Settings from it and Apply - for now places don’t update into the app automatically, you have to manually hit Apply. That may explain the name case issue. You don’t need to make the circles the smallest possible, you need to make them meaningful. Have you walked away enough to exit the outside circle? If you open the webCoRE app and wait for a few seconds, does it suddenly update? Perhaps an easily answered question. Can you give this over to friends/relatives without giving them access to the smartt home? Yes, you can register the browser, set it up, then log out and kill the app - it will keep working. OK maybe I am not understanding clearly. I opened the new instance of webCoRe then went to the Dashboard, settings, then places. It was correct there so I hit apply. It is still wrong in the SmartThings app for the motion detector. What am I missing? If you open the webCoRE app and wait for a few seconds, does it suddenly update? You I assume are referring to the DashBoard for the new instance? Open the webCoRE app and go to Settings and Apply to update the places in the app that actually tracks your location. Also, the DTH only updates when something changes - like you leaving home, getting far enough for the app to consider you left. OK went to Dashboard >Settings in upper right>Places, then clicked on map then saved. Is that correct? Did that but it still says JoEL not Joel don’t even know where that is coming from. OK The location on map never changes. So something is amiss. The name is correct now. We are talking about the map in the we dashboard. Correct? the location on the map is the location of the place, not your current location - it will never change - the presence changes, when you leave or arrive home… it will NOT show you on the map, sorry. OK then why doesn’t the sensor show away when I leave the zone? How far away did you go? You need to exit the larger circle, that’s about 500m away. OK maybe when I changed the diameter of the circle it remained the same at 500m. But I thought I changed it to 50m. When I go back in it looks like the 500m. I am not sure. In the IOS App it says under Awake 175 feet.is that the circle? If yes I went way farther than that. Tomorrow I will take a drive. I will check back in.